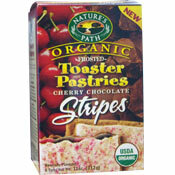 The complete name of this product is Nature's Path Organic Frosted Cherry Chocolate Stripes Toaster Pastries. I was enticed to buy this product because of the picture on the box. 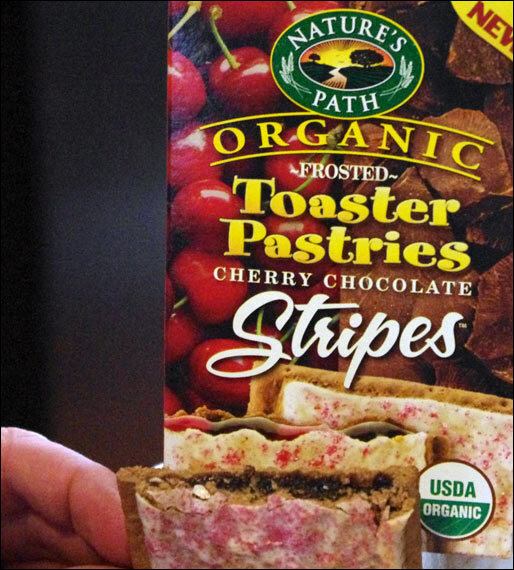 Amidst a background of juicy, red cherries and rich chunks of chocolate is a pop-tart (forgive the proprietary eponym) that's been broken in half to reveal a filling made up of stripes - vibrant cherry red and deep flowing cocoa brown - striped like the flag of a magical nation of toaster pastries. First, the bad news... this toaster pastry doesn't actually have any stripes. I toasted up a couple and broke them in half. I held them to the light. I took them outdoors to look at them in the sunlight. I asked other people if they saw stripes. The answer was no. If you want to buy this product because of the "stripes", don't do it. Stripes have no stripes. Now the good news... stripes or not, these toaster pastries taste good. The chocolate and cherry flavors work well together and bring to mind chocolate-covered cherry candies. The number one ingredient in the pastries is organic wheat flour, but fortunately they don't have the slightest wheat-like flavor. The pastry part of these pastries taste like any pop-tart you might buy from Kellogg's or Quaker. Be advised... despite the labeling of "vegetarian" and "organic fruit", these pastries are as guilty as any pop-tart for having a high sugar content and a low showing in dietary fiber. They should be enjoyed as a rare breakfast treat - a reward for having eaten healthier throughout the week. Nutritional considerations: Each single pastry serving has 200 calories, 4.5 grams or fat (2.5 saturated and 0 trans), 38 grams total carbs, 1 gram of dietary fibers, 19 grams sugars and 3 grams protein. 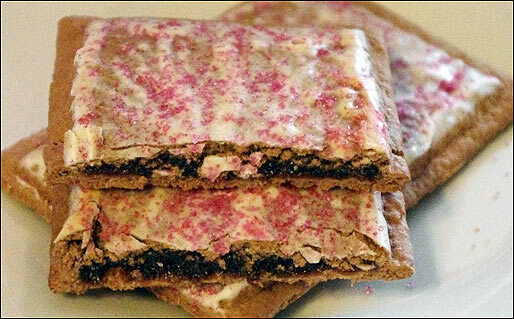 What do you think of Stripes Toaster Pastries?